It's easy to add a custom touch to so many projects with our amazing selection of personalized stamps and accessories, available in an exclusive offer from Bradford Exchange Checks. Browse our unique selection of stamps and you're sure to find a design that catches your eye. 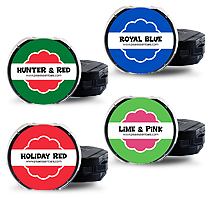 Many designs feature your name, initials and more for a memorable presentation and each design arrives with a stamp mount and free black ink cartridge, good for up to 10,000 impressions. Whether you're sending wedding invitations, holiday cards or use your personalized stamp for something truly unique, you're sure to make your mark! Not only do we offer a remarkable selection of personalized stamps, you'll also find a stunning selection of fill-in stamps. 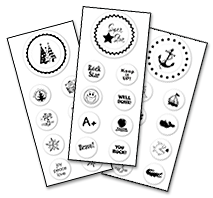 These rubber stamps are specially designed to pair a unique design with a space for you to fill in names or anything you wish. 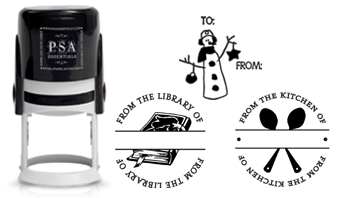 Imagine how one of our gift tag fill-in stamps would add a special touch to your holiday gifts, and save time, too! You'll also find designs you can use to share your recipes in style and book fill-in stamps that help you claim ownership of your books and other belongings. What a unique way to leave a lasting impression! Each PSA stamp offered from Bradford Exchange Checks is created with non-lead, non-PVC polymer die, so you can be assured that every impression you create will be crisp and clear. Plus, if you decide on a personalized stamp or fill-in stamp, you are well on your way to expanding your creative options. That's because you can use our innovative Peel and Stick stamp sets with the same stamp mount. 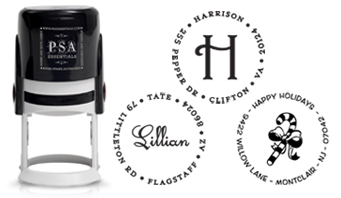 Just mix and match these interchangeable stamps on your stamp mount to create something truly one-of-a-kind! Designs include Snoopy, festive holiday visions, nautical scenes and more perfect for school projects, note cards, scrapbooking and anything you can imagine! We also offer a vibrant selection of ink colors, in both one-color and two-color options. 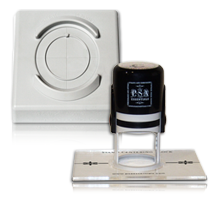 These cartridge-style ink refills slide in and out of your stamp mount in seconds and are good for up to 10,000 imprints. You'll also find additional tools that are helpful to have at hand, including the Peel & Stick Alignment Tool and the Stamp Centering Block. You're sure to find everything you need to create so many unforgettable projects at Bradford Exchange Checks, so don't wait to showcase your creativity! Shop Now!